Home > Reviews > Germany > Panzerkampfwagen I & II and Variants by Terry J. Gander. Tanks & Armour, Ian Allan Publishing. 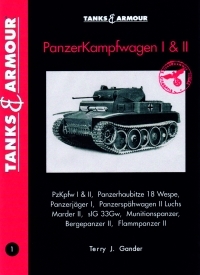 The Panzer I and II have not been given much coverage in either models or references. In 1/35 scale, there have been some newly released Panzer Is from Tri-Star plus older Panzer II, Wespe and Marder II from the likes of Tamiya and Dragon. In 1/76 scale, there are more older models from Matchbox, Fujimi/Nitto and in 1/72, Esci and Hasegawa but nothing new at all. Italeri are about have recently re-released the old but good Esci Panzer I and I think Trumpeter have announced a Panzer II, but it is nothing like the flood of Tigers and Shermans and the same goes for books. This new series from Ian Allan Publishing, called Tanks & Armour, goes part way towards redressing the situation on the books side of the problem. It comes with four chapters, Development, Description, Armament and Variants. Each chapter covers both tanks, Panzer I and Panzer II, with many period black and white photos, colour walk-round shots, colour art-works and line drawings. Because it's written by an Englishman and published by an English publisher it's much easier to read than some of the European books on the same subjects which suffer from interpretation problems. In the last chapter, Variants, it covers such vehicles as the Panzer I Command Vehicle, Marder II and Wespe. As with anything, it has faults. The art-work needs a little more attention. Firstly, although it is colour art-work, it has very little colour in it. I don't think this is the artist's fault but the publishers or, to be more precise, the printing process. They look like B&W drawings with tinting in some areas. Although some of the variants were produced in the mid to late war period and would there-fore have come in Dark Yellow, none are drawn this way. Instead, they're all done in boring old Panzer Grey with some areas of washed-out Brown or Green. Proof reading needs to be tightened up a bit. Two instances that come to mind are artwork of an obvious Panzer II titled as a Panzer I and a Marder II called a Marder III. These books are supposed to clear up confusion, not create it. Even with the above criticisms, I found this a very interesting read with many good photos and four view plans of both basic tanks in what I think is 1/35 scale although the scale is not given.